The last challenge brought out huge creativity and fun from all of us Macpassionate bakers. It's been a wonderful beginning to 2010, and we have more and more tweeps joining our blogroll. We are just four attacks down, and have a proud 46 mac-magicians on board, and the excitement continues. With February here, and all the love in the air, what better theme to call out for but a Valentine Special. Saving all my kisses for you...and macarons too. Please have your Mac Attack Post up no later than February 10 '10. Round up will be on Valentine's Day, February 14, 2010. If we have as many or more than this last challenge, we will divide the round up into groups to make sure everyone's macs are visible and you have the time to visit all of them. I am in , I will wait for making them as hubby is going to US and sis had send a pack for him to bring it back to me. One of the things she said are food paste colours so i am hopping there will be some fab colours in the pack. I love the profile pic of Jamie and Deeba. I'm in. Praying for feet this time round!!! way too soon, I only made macarons once, please let me practice first! (They looked like macarons but without the feet.) Stumbled upon this site through Deeba's mac attack logo. I think i am in... will get practicing and will have them posted by Feb 10th.. Mine are up - To Australia with Love - the macington! I have to ask - is the competition open to all types of macs? French? Italian? Do they have to be pink or red? Any particular requirements that make them Valentine's macs? Jessie T. - This is not a competition, it is a communal virtual kitchen where we all bake together, help each other, share recipes and tips and secrets and ideas, ask questions, give advice and just have a lot of fun. We choose a theme each month in order to ignite the creative juices and get everyone to try new things. Some of us do simple macs (some are still trying to get macs with feet! ), some have ventured over to Italian meringue macs. This month's Valentine's theme is personal and up to you! Just let us know why the macs you make are special for Valentine's Day! And of course don't forget to mention Mactweets and the Mac Attack in your post with a link back to this site! Welcome to you! The more the merrier! Thanks! I'm super excited. I just (finally) found a local source for almond flour so I can stock the pantry in no time. Uh-oh, I've just realised the deadline is 10th, not 14th February, as I thought. I'd better get my egg whites matured, ¡rapido! I am SO releived that I finally found feet!! Also put the failres to some yummy use Mac-a-Verrines! My post is up. Great challenge! Post is up. Cherry macs with a chocolate-port ganache. Thanks again for hosting this thing guys. Love the macarons that are coming in. can see the love flowing in with them!! Ladies, I submit Triple Chocolate Macarons. My first successful batch using the French method. So successful, I could even be converted from the Italian. Okay, mac friends, the kitchen witch is in. I tried raspberry filling, to give it a festive Valentine's twist. Can't wait to see your posts! Here's my entry daaaaaaahlings: chocolate macarons with "Very Valentine" white chocolate vanilla bean butter cream. I made Cinnamon heart-shaped macarons for this challenge and for Valentine's Day! My hearts look more like V's but it was a first effort at rebelling against the usual circled shells! Me too! Me too! Finally! Two tries but both so delicious! Blueberry Hibiscus Macs filled with Mascarpone Vanilla Blueberry Cream. here are my heart-shaped macarons, with handwritten icing! I made heart shaped macarons too :) Coffee coconut macarons with a coffee ganache filling. My first attempt at making macarons! Pink with vanilla buttercream. Just in time for me to make a second batch for a valentine's day party. Didn't think I was going to make this in time! I just discovered your pages recently. What a great idea! Another reason to practice for the perfect macarons. WOOT ... getting blown away ABSOLUTELY by all the creativity. Thank you all for being part of Mactweets! Here is my first submission http://www.make-fabulous-cakes.com/french-macarons.html. Pink macaron with raspberry filling on chocolate almond cake with strawberry mousse. @Fabelicious - I jumped over to your blog to check out your macs and was flabbergasted by the beauty of that cake and the photo but sadly cound NOT leave a comment! Just wanted to thank you for making such a stunning mac dessert for VDay Mactweets! Thanks Jamie. Glad you like it. I'm very happy to discover this site. Thanks for a great mac challenge, guys! Thank you for the challenge and pulling me out of my comfort zone. Hehe. 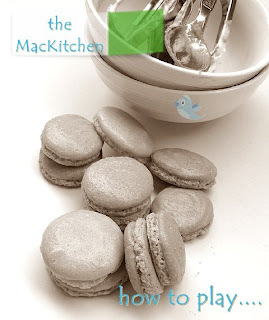 I LOVE this Macaron only blog site! Keep it going!! Mine's been up, I just kept forgetting to come back to post! Here I am!!! A first ever, Southwestern Mac!